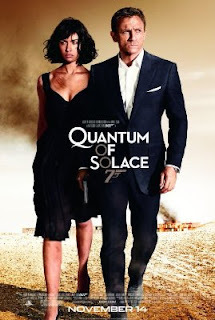 Last Friday I watched the new James Bond film, titled Quantum of Solace. Although I am not a very big James Bond fan, I must say that I enjoyed the last Bond film (Casino Royale) and I really like Daniel Craig's take on James Bond. He brings a depth and brutality to the character that I really like. Because of that, I was excited about Quantum of Solace and went to the screening expecting it to be as good as Casino Royale and hopefully better. Sadly this is not the case. While the new film is still very entertaining, it is certainely inferior to Casino Royale. I can't quite put my finger on what it is that didn't work for me, but I felt a bit uninvolved to the story and the characters seemed a little undeveloped (besides Bond and M who were once again great). As for the women in Quantum of Solace, Olga Kurylenko is a very beautiful woman but her acting leaves much to be desired and her character was much less interesting than Eva Green's Vesper Lynd in Casino Royale. That being said, I must say that the direction towards realism the last two Bond films have taken is a very good thing and I sincerely hope we will see Daniel Craig put on the Bond suit for a third time!